Mount Everest is the world’s highest peak measuring just over 29,000 feet in height. In Nepal it is called Sagarmatha Mount Everest while the people of Tibet named it as Chomolungma. Mount Everest stands in the sub-range of Himalayas and it mainly touches the international borders of China and Nepal. The Mount Everest is certainly the highest peak on Earth. In 1865, Royal Geographical Society gave it the English name Mount Everest. If you love to know all about Mount Everest perhaps you’d like to continue reading the most amazing and interesting Mount Everest facts for kids. A magnificent view of the Mount Everest as the sunset lights the summit. Mount Everest Facts for kids. Many surveys occurred around Mount Everest during the early 18th and mid-19th centuries. In 1715, Qing Empire mapped the territory of the Mt Everest which they called it Qomolangama in 1719. In 1802, a British team came to take the measurements of the world’s highest peaks. They were a team of 12 men and they carried big theodolites weighing up to 1,100 pounds each. British men had made it to the Himalayan foothills by 1830 but they weren’t permitted by the Nepal government. Andrew Waugh, one of the prominent British surveyors had started measuring the height of Mount Everest in 1847 from Swajpore station. The station was thought to be 150 miles away from the Everest. Before surveyors measured Mount Everest, Kangchenjunga was believed to be world’s highest peak. When John Armstrong, one of the Andrew Waugh’s subordinates, took a closer look at Mount Everest and Kangchenjunga he found the former slightly higher than the latter. They used to call Everest as ‘peak b’. John Armstrong wasn’t, however, sure if Mount Everest was actually higher or it just looked like one. In 1849, James Nicolson, yet another surveyor calculated and concluded that peak b or Everest appeared to be higher than Kangchenjunga. But since they couldn’t get any closer to the peak due to bad weather they were just not able to confirm their calculations. Nonetheless, in 1852 an Indian mathematician Radhanath Sikdar had recognized Mount Everest to be the world’s highest peak. Sikdar had used trigonometric calculations which were entirely based on Nicolson’s measurements. In 1854, Andrew Waugh had worked for as long as 24 months to eventually come up with precise measurements. In 1856 Waugh had officially announced Mount Everest to be the highest peak in the world whereas Kangchenjunga as the second highest. The height of Kangchenjunga measured at 8,582 m (28,156 ft) only slightly lesser than the Mt Everest. 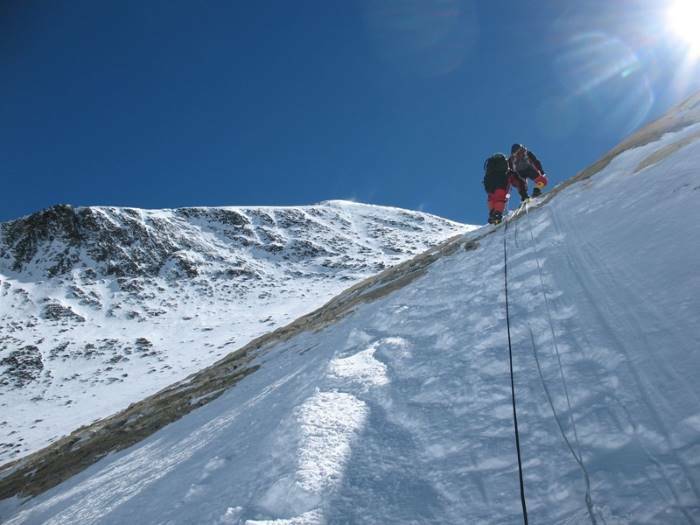 Climbers often leave mountaineers behind if they cannot walk on their own. They do so because there is no way climbers can carry injured partners on the dangerous routes of the Everest. Mount Everest Facts for kids. The Everest Formation goes all the way to the top covering 8,600 meters (28,200 feet). The rocks at this Formation display grey and white color. The North Col Formation occupies much of the Mt Everest running between 7,000 and 8,600 m (23,000 and 28,200 ft). The rocks display unique yellowish brown color. There are several marbles and metamorphic rocks on the North Col Formation. The Formation has layers of biotite-quartz phyllite, chlorite-biotite phyllite, shale, mudstone, sandy limestone, and calcareous sandstone. The Rongbuk Formation is found right at the base of the Mount Everest. It is composed of dikes of leucogranite, gneiss, sills, and sillimanite-K-feldspar. Studies suggest that the metamorphic rocks and sedimentary rocks of Mount Everest mainly consist of Archean granulites of the Indian Plate which might have possibly formed when Asia collided with India. 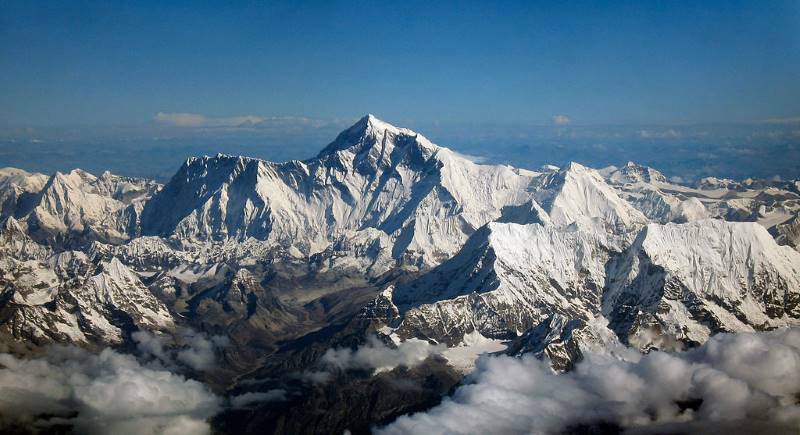 Geologists claim that the Himalayas are rising 5 millimeters with each passing year. What Animals & Plants Live around the Mount Everest? Due to the extreme weather conditions, there are very few animals or plants occurring on the Mount Everest. Prominent among plants are mosses that reach a length of about 6,480 meters (21,260 feet)—making it the only plant that exists at such a height. Arenaria is yet another plant which is found at a height of 5,500 meters (18,000 feet). As far as animals are concerned, jumping spider Euophrys omnisuperstes is found at a height of about 6,700 meters (22,000 feet). Scientists predict that there may be many microscopic species occurring at higher altitudes. Bar-headed goose is a bird that lives in the higher altitudes. Mount Everest climbers have also spotted Yellow-billed choughs at 7,900 meters (26,000 feet); chough and South Col at 7,920 meters (25,980 feet). 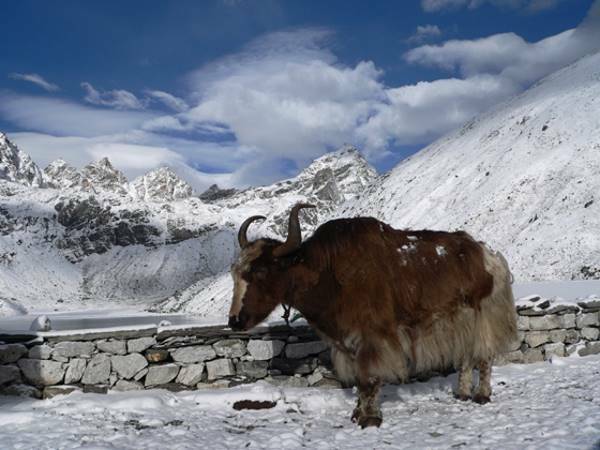 Yak makes habitat at a height of about 4,790 meters (15,715 feet). Yak is quite dangerous for climbers as it is capable to push climbers off the downhill edge. Himalayan tahr, snow leopard, Himalayan black bear, red panda, and pikas are some of the other animals that are found at high altitudes. Edmund Hillary (left) and Tenzing Norgay (right) were the first climbers to make it to the Everest. Sir Edmund Hillary set his foot on the summit first. Mount Everest facts for kids. The average temperature at the Mount Everest is about −17 °C (1 °F) which is taken from a station installed at a height of about 26,246 feet. The station was created in 2008. The humidity is measured at 41.3 percent whereas the atmospheric pressure is estimated at 382.1 hPa (38.21 kPa). The wind speed is about 12.8 m/s (28.6 mph, 46.1 km/h) and the wind direction 262.8°. The weather station showed the global solar radiation 711.9 watts/m2. The solar UVA radiation was 30.4 W/m2. Scientists installed the solar-powered weather station on the South Col. The Mount Everest climbers usually face high-speed winds at the peak which is deemed to be one of the biggest challenges to them. The average wind speed at Mt Everest is about 160 km/h (100 mph) with the maximum speed recorded at 280 km/h (175 mph) in February 2004. The Mount Everest winds flow like a Jet. They can easily take the climbers off the Everest. Mount Everest Map. Mount Everest Facts for kids. The Mount Everest is located in the subrange of Himalayas, Mahalangur Himal. The mountain touches the international border of China, Nepal, and an independent region of Tibet. How High is Mount Everest? – How Tall is Mount Everest? Mount Everest is 8,848 meters (29,029 feet) high. The Everest peak lies at the highest level above the sea level. What Mountain Range is Mount Everest in? Mt Everest stands at the highest mountain ranges in the world—Himalayas. Mount Everest is Located in which Country? Mount Everest is found in three countries: China, Nepal, and an autonomous region of Tibet. How Many Miles High is Mount Everest? The height of the Mt Everest is about 5.498 miles. How Tall is Mount Everest in Feet? Mount Everest is 29,029 feet tall. Cost to Climb Mount Everest? The total cost to climb Mt Everest is estimated at £100,000 as of 2015. You are going to need a permit for climbing Everest. The permit costs you around $US7,000. 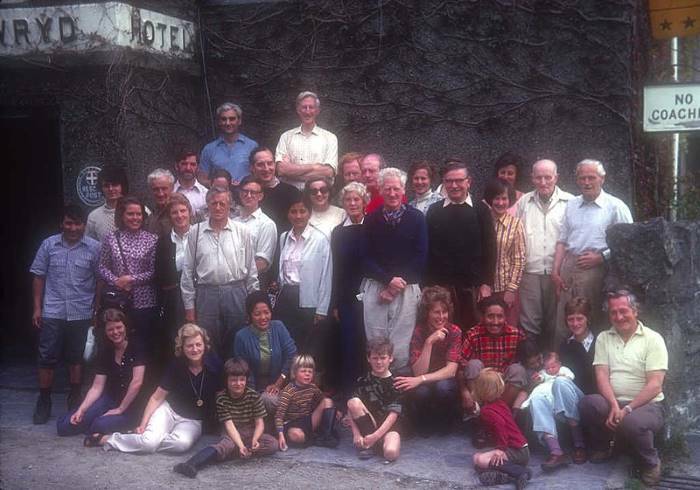 A group of British climbers in 1953. Mount Everest facts for kids. Who Named Mount Everest? – How Did Mount Everest Get its Name? Natives of Tibet and Nepal came up with local names for Mount Everest but Andrew Waugh claimed that there isn’t local name for Everest. Tibetan and Nepalese had named the peak as ‘Deodungha’ meaning Holy Mountain or ‘Darjeeling’ means Chomolungma. The word Chomolungma had a little history. A French photographer in 1733 had used the name Chomolungma on his map for Mount Everest. Similarly when European showed up in 19th century they called the peak as Gaurishankar which occurred between Mt Everest and Kathmandu. Andrew Waugh suggested, and perhaps rightfully, that there were many different local names for the Everest so it’d be hard to choose one out of them. Waugh therefore, proposed that the peak should be named after Sir George Everest, a Welsh surveyor. However, George Everest asked to withdraw the name Everest for he thought that Indians might not be able to pronounce it correctly. In 1865, the Royal Geographical Society finally decided ‘Everest’ to be a new name because many surveyors and natives went in favor of Waugh’s proposal. ‘Peak XV’ was the old name of Mt Everest. Climbing Mount Everest is probably one of the toughest tasks you’ll ever do. Since it’s the world’s highest peak from the sea level, the Mount Everest has long been attracting thousands of world’s best climbers. We don’t know for sure if Mt Everest was ever climbed by any ancient climbers but we do know that climbing Mount Everest began somewhere in 1920s. The Mt Everest hasn’t been climbed by more than 200 professional climbers till 1987. This shows that how difficult it might have been even for professional climbers. In 1990s, Mount Everest expedition has been started commercially as groups of climbers increased many times in comparison to 1980s. Mount Everest has been climbed 5,656 times till March 2012. Out of these attempts 223 climbers died. Mount Everest climbers often die of freezing winds reaching speed of 200 miles per hour; or high-speed avalanches, or even blizzards. 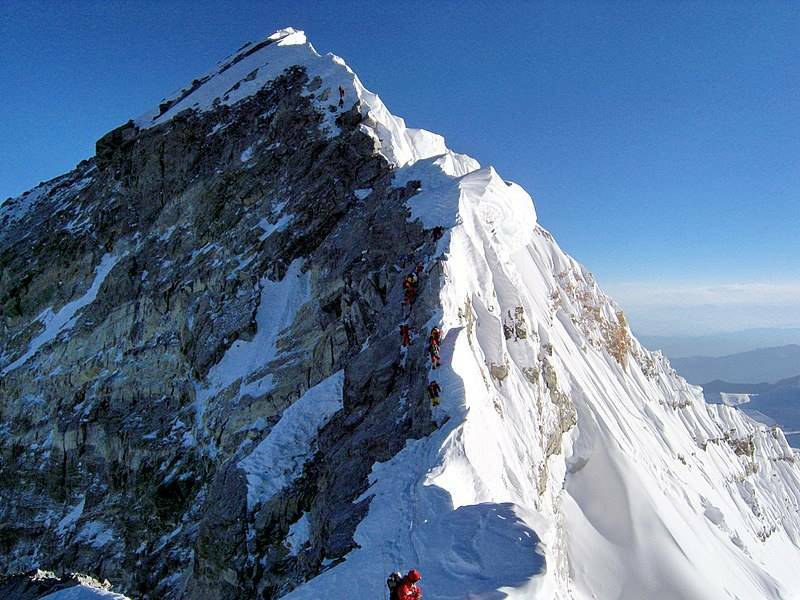 According to the Himalayan Database, 4,042 climbers made it to the 6,871 summits. Who Climbed Mount Everest? – People Who have Climbed Mount Everest! Clinton Thomas Dent was probably the first person who said it was possible to climb Mount Everest. He said it in his book Above the Snow Line in 1885. In 1921, Guy Bullock and George Mallory made unsuccessful attempts to make it to the Everest. They didn’t prepare well to get up there. Both climbers had nonetheless managed to climb up to 7,005 meters (22,982 feet). On June 8, 1924, Andrew Irvine and George Mallory made attempts and they chose North Col-North Ridge route. Sadly however, both climbers died on their Mount Everest expedition. We didn’t know if they actually made it to the summit. In 1952, Edouard Wyss-Dunant led a group of climbers and they got up to 7,986 meters (26,201 feet). 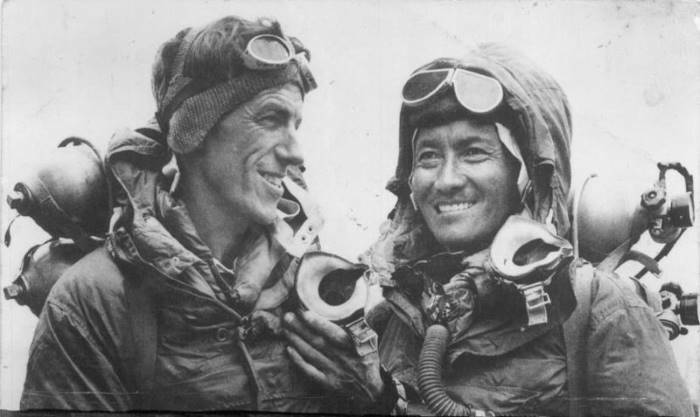 Sherpa Tenzing and Raymond Lambert had also climbed up to 7,986 meters (26,201 feet). In 1953, Sir Edmund Hillary and Nepali shirpa Tenzing Norgay had reached the summit successfully. On May 23, 1956, Juerg Marmet and Ernst Schmied also successfully made it to the summit. On May 24, 1957, Hans-Rudolf von Gunten and Dolf Reist had climbed the Mount Everest. On May 25, 1960, Gonpo, Qu Yinhua, and Wang Fuzhou made it to the summit. On May 1, 1963, Jim Whittaker, an American, had reached the summit. Jim is the first American to climb the Mount Everest. He was accompanied by Nawang Gombu. In 1979/1980, a group of Polish climbers had climbed the Mount Everest in winter. Andrzej Zwada led the group. Due to this brave attempt, polish climbers had earned the name of Ice Warriors. Edmund Hillary from New Zealand and Tenzing Norgay, a shirpa from Nepal were the first persons to climb Mount Everest successfully in 1953. Hillary and Norgay made it to the summit at 11:30 local time on May 29, 1953. While both climbers had reached at the same time, Tenzing disclosed some years later that it was Hillary who first put his foot on the summit. That makes Edmund Hillary the first person to climb the Mount Everest. Hillary and Tanzing had stayed there for a while; they took photographs and put some sweets into the snow before began descending. The year 2017 appeared to be the biggest season for climbers. Ueli Steck, a Swiss climber, died when he fell during warm up climbing. Is Mount Everest a Volcano? No, Mount Everest is a mountain one that doesn’t contain any volcanic eruptions. Nor are there any active sources of lava in Himalayas. When was Mount Everest First Discovered? We do not know precisely when it was first discovered because there was no data provided by historians that showed that any climber could have possibly climbed the summit in ancient times. Well! Technically speaking, Mount Everest is not the tallest mountain in the world. It is the highest peak from the sea level. You read it right! The height of the Mt Everest isn’t the greatest. There are some mountains that are taller than the Mount Everest. For instance, Mauna Kea of Hawaii. Mount Kea is 10,200 meters (33,464.6 feet) high while Mount Everest’s height is about 8,848 meters (29,029 feet)—making Everest 4,000 feet shorter. It is just that the summit of Everest lies at the highest point of the earth’s surface. The summit is at the greatest distance above the sea level. The mountain itself doesn’t have the greatest height. Therefore, it is logical to assume that Mt Everest is probably not the world’s tallest mountain but it is certainly at the highest level above the sea level. The summit of the Hawaii’s Mount Kea is only 4,205 meters (13,796 feet) above the sea level. Similarly, the Mount McKinley in Alaska is also taller than the Everest if we measure its height from the base to summit. However, it reaches only 6,190 meters (20,308 feet) height above the sea level. In 1970, a group of one hundred Japanese climbers made an attempt to the summit. They were not only all prepared and equipped; they had planned for decades to get to the summit. Despite all these planning, eight of the Japanese climbers lost their lives. In October 1993, Karl Gordon Henize, a U.S. astronaut had climbed up the summit to understand radiation but he suffered from high-altitude pulmonary edema while he was descending. Karl died in a north camp and his fellow climbers buried him on Mount Everest. In 2014, avalanche hit climbers claiming as many as 15 lives. It is one of the worst disasters in the history of Mount Everest. In 2006, 12 climbers died while climbing Everest. One of the climbers was left by his fellow climbers in a tent—they thought him dead. However, he was alive and later rescued successfully. One of the climbers, Beck Weathers claimed that mountaineers usually do not rescue their partners for if they do it’ll only cause more deaths. Weathers said that he was left twice by his fellow climbers but he was able to walk on his own. 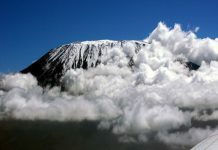 On April 18, one of the worst avalanches hit the Base Camp at 18:30 local time. The avalanche claimed 16 lives at an altitude of 5,900 meters (19,400 feet). All of the dead were Nepalese guides. In 2014, snowstorm struck the Nepal trekkers and claimed 43 lives. They were only climbing for the summit. They were only trekking. Peter Kinloch, a British climber, had reached the summit on 13:00. It was a bright sunny day when he got there. Peter started taking photographs as many as he could from the top of the world. However, minutes later he went blind only to die of extreme cold. The deadliest of the Mount Everest’s incidents occurred on April 25, 2015 when a 7.8-earthquake claimed 22 lives of the climbers. They were from China and Nepal. Which is the Biggest Year for Climbing Mount Everest? According to stats, 2015 is likely to be the record-breaking season for climbers. China and Nepal have issued many permits in 2015. On April 25, 2015 one of the worst earthquakes measuring up to 7.8 in magnitude struck Nepal. The climbing activities were shut down then. The earthquake also claimed the lives of eight climbers who were already in the Base Camp of the Mount Everest. How Old is Mount Everest? What Does the Top of Mount Everest Look Like? At the top of the Mount Everest lies a summit which is the rooftop of the world. The summit is nearly the size of a dining table. Climbers spend only a few minutes on the summit for the sunlight at that height likely causes damage to the vision. One can easily go snow blind. There are two important routes to the summit. One is the southeast ridge that begins at Nepal while the other is north ridge from Tibet. There are also some other Mt Everest routes but they are not really recommended and most climbers, not even professional mountaineers fancy choosing them. The climbers mostly use southeast ridge route to climb. Even Edmund Hillary and Tenzing Norgay had used the southeast ridge to reach the summit. While southeast ridge is the hottest route, May is the hottest month for climbers. A few climbers make attempts in September or October. The southeast ridge and the north ridge end up on the same summit. The summit is no greater than the dining room table. There is an area called rainbow valley where many dead bodies are buried. There is also an area known as Death Zone where the oxygen level and pressure gets pretty low. The Danger Zone occurs 8,000 meters below the summit. The Death Zone is found at a height of 26,000 feet and it has a freezing temperature. Climbers are likely to slip or fall over because the Death Zone is all covered with frozen snow. The atmospheric pressure gets extremely low on a Death Zone. Climbers usually take 12 hours to walk just over a mile to the summit. If a climber is a non-professional he/she’ll likely fall unconscious in 2 – 3 minutes. In 1922, Geoffrey Bruce and George Finch were the first of the climbers who had reached the height of 8,000 meters (26,247 feet). In 1953, Sir Edmund Hillary and Tenzing Norgay are the first climbers who had successfully made it to the Mount Everest. In 1960, Gonpou, Wang Fuzhou, and Qu Yinhua of China were the first climbers to ascend via North Ridge route. On May 16, 1975 Junko Tabei became the first woman to reach the Mount Everest. 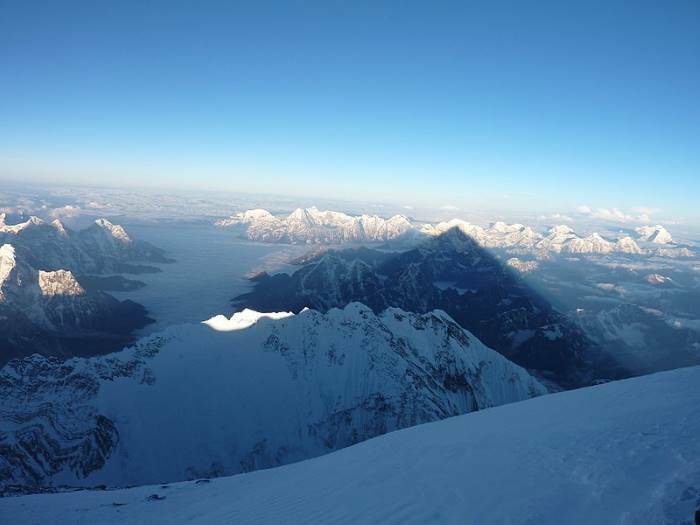 Phanthog is the first woman to reach summit using North Ridge. She did it in 1975. Reinhold Messner in 1980 became the first solo Mount Everest climber. In 1988, Lydia Bradey became the first woman to make it to summit without supplemental oxygen. Kazi Shirpa became the then fastest climber of Mount Everest using southeast ridge. He didn’t use supplemental oxygen. Kazi Shirpa took just 20 hours and 24 minutes. In 2000, Davo Karnicar had become the first climber to descend by ski. In 2001, Erik Weihhenmayer set a world record of being the only blind climber who made it to the Everest. Who Climbed the Mount Everest Highest Number Times? All of these climbers have made it to the Mt Everest 21 times. Lhakpa Shirpa holds the world record of most ascents. Lhakpa has climbed eight times. She is from Nepal. Dave Hahn, a U.S. climber, holds the record of the highest number of summits by a foreigner. Dave has reached the summit 15 times. Ang Rita, from Nepal, is the only woman in the world who has climbed 10 times without supplemental oxygen. Who Stays the Longest on the Mount Everest? Babu Chiri Sherpa of Nepal holds the world record of longest stay on the summit. Babu reached the summit on May 6, 1999 and he stayed there for as long as 21 hours. Who did the Fastest Ascents to the Mount Everest? Pemba Dorji, from Nepal, is the world’s fastest Everest climber. He made it to the summit without using supplemental oxygen. He took 8 hours and 10 minutes. Pemba set the record on May 21, 2004.
Who is the Oldest to Climb Mount Everest? Yuichiro Miura, a Japanese climber, holds the world record of being the oldest Mount Everest climber. Miura set the record on May 23, 2013. Miura was 80 years and 224 days old when he made it to the Everest. Who is the Second Oldest to Climb Mount Everest? Min Bahadur Sherchan, a Nepalese climber, is the second oldest to make it to the Everest. Bahadur set the record in 2008. He was then the oldest to reach summit. Five years later Miura broke his record. Bahadur’s age was 76 years and 340 days when he reached the summit. Who is the Oldest Female to Climb Mount Everest? Tamae Watanabe, a Japanese climber, set the record of being the oldest female to reach summit. She set the record on May 19, 2012. Interestingly, Tamae broke her own record after 10 years. She was 63 years and 177 day old when she did the first time in May 16, 2002. Tamae was 73 years and 180 days old when she made it to the Everest. Bonita Norris is the youngest British climber of Mount Everest. Mount Everest facts for kids. Photo by Daily Express. Who is the Youngest to Climb Mount Everest? Jordon Romero is the youngest person in the world to climb Mount Everest. He is from the United States. Jordon was 13 years 10 months and 10 days old when he set the record. 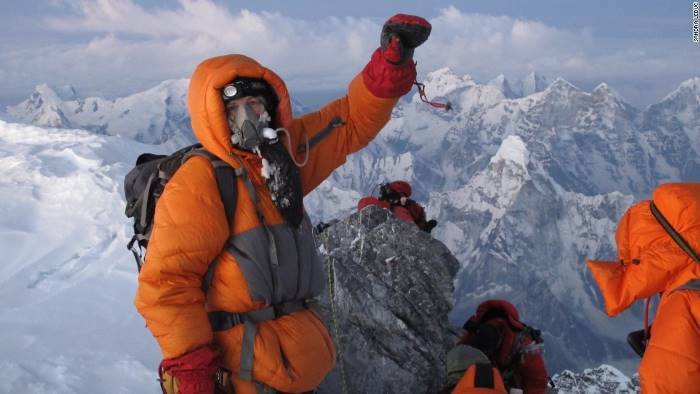 He did it on May 22, 2010.
Who is the Second Youngest to Climb Mount Everest? Ming Kipa, from Nepal, is the world’s second youngest person to climb Everest. She was only 15 years old. Ming did it on May 24, 2003. Malavath Purna, an Indian climber, holds the world record of being the youngest female to climb Everest. Malavath made it on May 25, 2014.
Who Climbed Everest on Amputated Foot? Tom Whittaker, a U.S. climber ascent on an amputated foot. Tom did it on May 27, 1998.
Who is the Blind Mount Everest Climber? Erik Weihenmayer, a U.S. climber, holds the record of being the only blind climber in the world. Erik made it to the summit on May 25, 2001.
Who is the only Everest Climber with No Fingers? Kim Hon-Bin is the only person in the world to climb Everest without fingers. Kim is from South Korea. He did it on May 16, 2007.
Who is the only Woman to Climb Mount Everest Twice in a Season? Chhurim, a Nepalese climber, is the only woman in the world who made it to the summit twice in a single season. Chhurim climbed in May 2012.